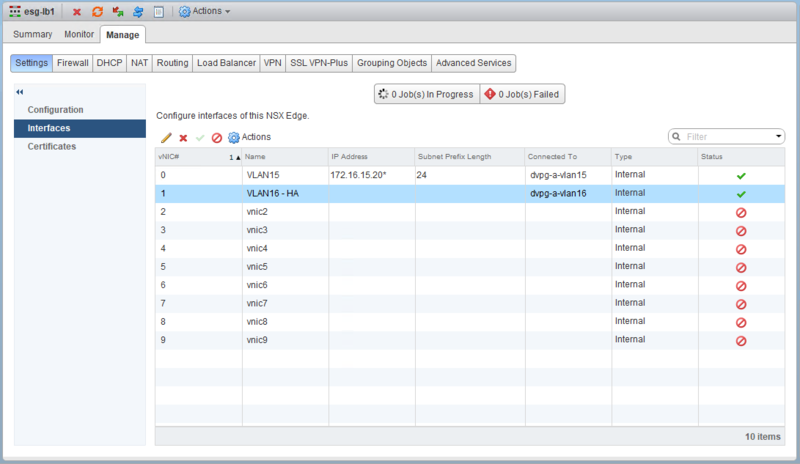 Welcome to the eleventh installment of a new series of NSX troubleshooting scenarios. Thanks to everyone who took the time to comment on the first half of the scenario. Today I’ll be performing some troubleshooting and will show how I came to the solution. Please see the first half for more detail on the problem symptoms and some scoping. As you’ll recall in the first half, our fictional customer was seeing some HA heartbeat channel alarms in the new HTML5 NSX dashboard. After doing some digging, we were able to determine that the ESG had an interface configured for HA on VLAN 16 and that from the CLI, the edge really was complaining about being unable to reach its peer. Welcome to the eleventh installment of my NSX troubleshooting series. What I hope to do in these posts is share some of the common issues I run across from day to day. Each scenario will be a two-part post. The first will be an outline of the symptoms and problem statement along with bits of information from the environment. The second will be the solution, including the troubleshooting and investigation I did to get there. A good question. This customer is using NSX 6.4.0, so the new HTML5 dashboard is what they are referring to here. Let’s see the dashboard alarms first hand. This is alarm code 130200, which indicates a failed HA heartbeat channel. This simply means that the two ESGs can’t talk to each other on the HA interface that was specified. Let’s have a look at edge-3, which is the ESG in question.